Patterns for e-business are a group of proven, reusable models that can help speed the process of developing applications. The pattern discussed in this book, the User-to-Business pattern, is the general case for users that interact with enterprise transactions and data. In particular, it is relevant to enterprises that deal with goods and services that cannot be listed and sold from a catalog. 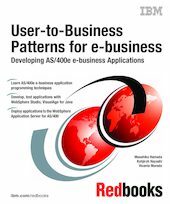 This IBM Redbooks publication discusses two application topologies of the User-to-Business pattern. Application topology 1 describes a situation where you build an application that has no need to connect to back-end or legacy data. Topology 2 extends topology 1 to describe a situation where you need to access existing data on legacy or third-party systems. For practical purposes, this book walks you step-by-step through the implementation of an e-business application using application topology 1 and the OS/400 system. The sample e-business application and associated files are available for download from the IBM Redbooks Web site.